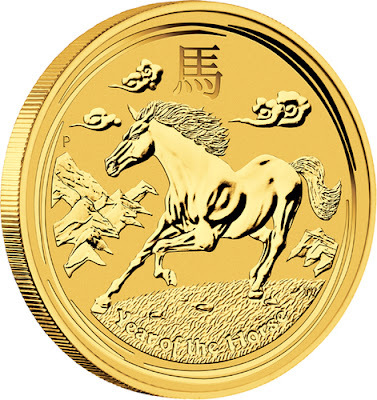 These magnificent gold coins celebrate the Year of the Horse, the seventh animal in the 12-year cycle of the Chinese zodiac. As well as appealing to investors, these superb releases are perfect for people born in the Year of the Horse – 1918, 1930, 1942, 1954, 1966, 1978, 1990, 2002 and 2014. No mintage limit applies to 1kg, 10oz, 2oz, 1/2oz, 1/4oz, 1/10oz, and 1/20oz coins. However, production will close at the end of 2014 when The Perth Mint will declare each coin's official mintage. A maximum of 10 10kg coins will be produced on a mint-to-order basis. Similarly, production will close at the end of 2014 when the coin's mintage will be declared. The Perth Mint will produce no more than 30,000 1oz coins. Production will cease when the mintage is fully sold or at the end of the series, whichever comes first. Due to the low mintage of the 1oz size it is highly collectable and is sure to sell out fast. Each coin’s reverse depicts a horse galloping amid a stylised scene of mountains and clouds. The Chinese character for ‘horse’ and the inscription ‘Year of the Horse’ also appear in the design with The Perth Mint’s traditional ‘P’ mintmark. The Ian Rank-Broadley effigy of Her Majesty Queen Elizabeth II, the 2014 year-date and monetary denomination are shown on the obverse of each coin. 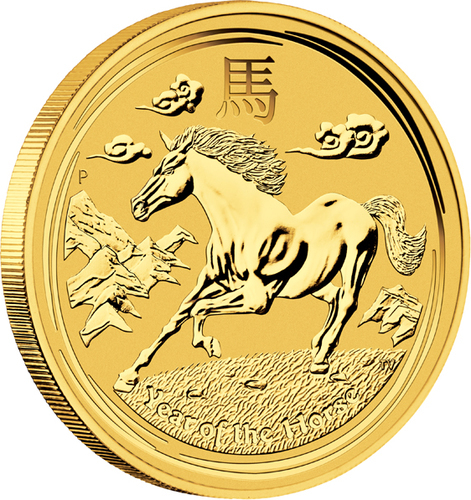 All Australian Lunar 2014 Year of the Horse gold bullion coins are presented in protective acrylic capsules.